Park Road Baptist Church in Charlotte, NC records our sermons each week so that you may listen online. Listen at the links below or subscribe to our iTunes podcast. We record our sermons each week so that you may listen to them again, or if you could not be present, listen for the first time. 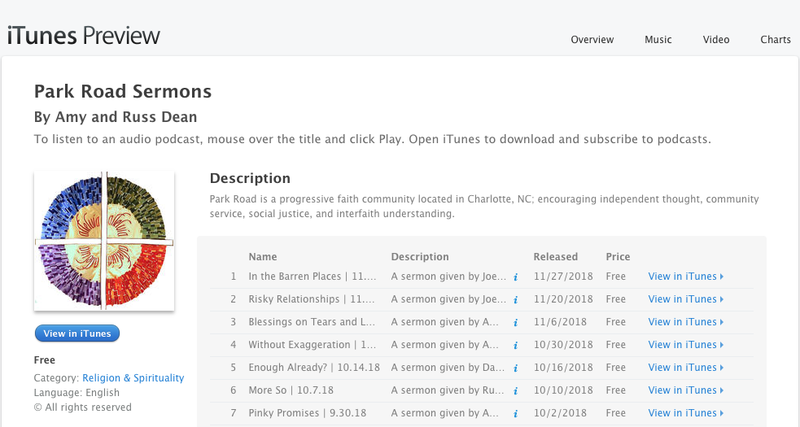 Park Road also has a podcast to which you can subscribe on iTunes and have sermons downloaded directly to your device each week by clicking here. Sermons are also available at Stitcher and TuneIn. Click on the links or search for Park Road Sermons. From Religion to Spirituality…And Back to Religion? See Our Complete Archives at SoundCloud! Search through all our past sermons via SoundCloud. Click HERE to see our channel. Find Park Road sermons on iTunes and Sticher! Now you can subscribe to our iTunes Podcast and have our sermons download automatically to your computer, tablet, or smart phone. Listen anytime and anywhere! Click HERE to link to iTunes. You can also listen on Stitcher.com. Click here to connect.